SnapCacklePop: Fifth Harmony get sassy in monster new video..! Fifth Harmony get sassy in monster new video..! 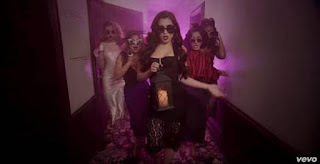 One of our favourite U.S girlbands Fifth Harmony are really getting stylish and sassy in this new video to accompany their single I'm In Love With A Monster a single from Hotel Transylvania 2. Looking gorgeous in their 50's inspired outfits outside the Hotel, the girls strut their moves to this jazzy light number, before heading into the hotel to explore and then getting cozy with the likes of Dracula and Frankenstein, as after all they are in love with a monster. The single features on the sound track for the movie and is available on iTunes now..!